The Awl’s holiday series on flavors and spices. As a kid in Texas, I spent most afternoons at my neighbor’s house—she was an elderly Spanish woman, she’d moved from Madrid for her own children—and after I’d annoyed her into oblivion for the whereabouts of her grandson, she’d sit me at her daughter’s table and cook me a meal. She made soups and queso frito. She rolled tortillas and empanadas. Sometimes she’d sit and watch me burn my lips on all them. But other days, she’d bring me clips of last night’s dinner, plastic plates of curried goat, or searing empanadas; but every now and again she’d lather her dishes with a powder, a smoky blend of spices that turned out to be achiote. Achiote is the same thing as annatto but sometimes people confuse the two. Annatto seeds are ground for achiote paste, and that’s blended with other spices to serve as a rub. It gives your food this orange-ish color. Or a yellow-ish one. Or a pulsing red. The seeds are extracted from Bixa orellana, which lives and dies in tropical climates, and if you’ve spent time in Latin America or the Caribbean or the southwest States, then you’ve seen it dashed somewhere across your plate. It also makes a pretty good pigment: Mexico’s 16th century Aztecs used achiote to paint their manuscripts. The United States’ Native populations have long utilized the paste as a dye. Some folks in Colombia crush achiote to ward off spirits, and other folks in Brazil would spread it as a war paint, but I think a pinch in your sofrito is the closest anyone ever gets to God. 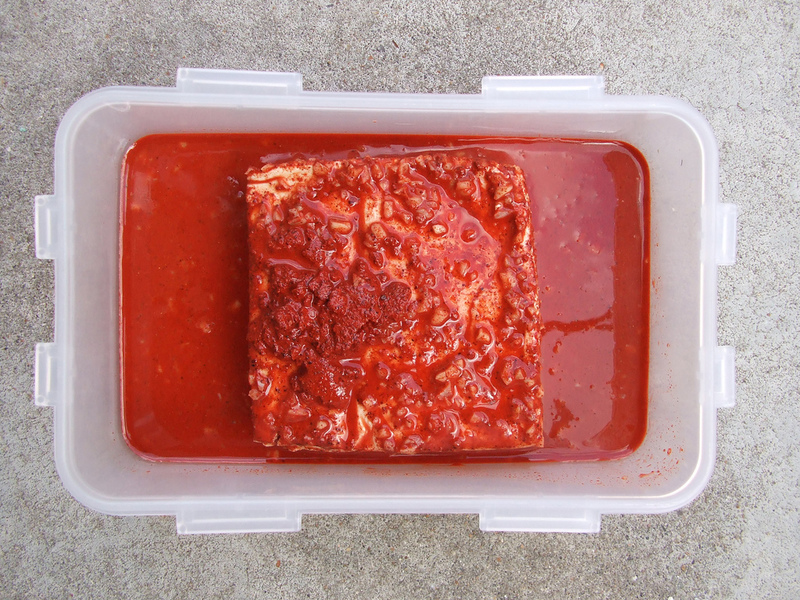 I’ve seen buckets of achiote spread across pork pits in Jamaica. At this airport in Panama, a bartender scooped a patch all over my sandwich. In Shinjuku’s red-light district, at a leaning fried-chicken stall, a lanky man in glasses sprinkled a thimbleful over my wings. And one night, in Cahuita, on the western edge of Costa Rica, I sat under a tent while a family cooked with some under a cauldron. Eventually, a woman set this cup of stew in front of me, only to pick it back up and dip the powder over the brim. Por suerte, she said, smiling a little, and I bent to take a sip and it burned. I tried cooking with it once. Twice. Three times. Couldn’t seem to get it right, or at least not the way I remembered it. Once, my mother was prepping a drawn-out dinner with her friends—Jamaican women who grew up on the island. Folks who carry its recipes on their fingers. I saw one lady handling the seeds, mashing them under a pestle, and when I peeked over her shoulder she jounced me with her hip. When I asked her how she’d made it, she looked a little incredulous. You do, she said, and I confirmed that I did not. Well, she said, it’s just like this, but she did not tell me what it was just like. When the food was cooked and the entrees were served, the achiote sat on her snapper. Simmering in the sauce. I took a bite and gasped. My mother’s friend glowed, sitting across the table, knowing and not telling. This would’ve been easier if I’d just asked my neighbor how she’d done it. She only spoke Spanish, and I didn’t know much at the time. But years later, after she’d passed, I found myself back in her kitchen, cooking a meal with her grandchildren, looking a little lost. We stood around the counters she’d commandeered. Rolling dough with her pins. Boiling pasta in her pots. It all felt disingenuous. Like we were imposters. Then her grandson—I’d finally found him—reached in the cupboard for a rusty black tin; and of course it was inside there. His grandmother’s achiote. Except it wasn’t hers. He’d ground it up and made it himself. So I asked him how he’d done it. He frowned a little bit. You don’t know? he said, and I told him I did not. She cooked for you as much as anyone, he said, and I was ashamed. But in the end, he did show me. He doled out the cumin. I chopped the garlic. We poured the juice and mashed the berries. I sliced through the limes, he held my wrist as I ground the seeds, and I watched him handle the bowl as he blended them together. And while I’d like to say that it tasted inedible, that it was nothing like his grandmother’s recipe—because it was one of the many things she’d taken with her, and some things you just shouldn’t try to get back—the truth is that it was incredible. Tasted exactly as she’d made it. Or at least the memory of how she’d made it, a passing imitation, a lingering sense of the spice, which is honestly as close as any of us ever gets.